On a day when Dustin Johnson set a course record with a 9-under 63, our man Charley Hoffman was looking to position himself for a weekend run at the BMW Championship. 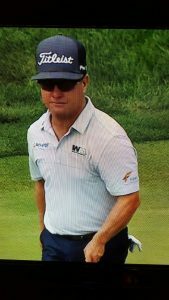 Charley was rockin’ the Flash Global logo and looking pretty good on the leaderboard too — despite a hiccup on the closing hole. Charley stepped up to the 457-yard par-4 18th having carded birdies on two of the three previous holes. He dropped his tee shot in the drink some 284 yards out and went on to post a bogey-5 to cap a round of 1-under 71 that could have looked so much better if not for that errant tee shot. He is currently tied for 19th after 36 holes, at 4-under 140, 10 shots behind co-leaders Johnson and Roberto Castro. But let’s be real here. Winning isn’t everything, and it’s certainly not the only thing here at this third stop of the FedExCup Playoffs. Sure, Charley wants to win. No doubt. But he doesn’t have to win. He simply needs to play his way into the top 30 in the FedExCup Point Standings. The top 30 after the next 36 holes move on to play in the TOUR Championship in two weeks. The rest go home without getting a shot at the $10 million bonus that comes with a TOUR Championship title. The projected standings, current as of Friday’s round, have Charley at No. 36 — exactly where he was coming into this tournament. Saturday is moving day at the BMW Championship, and we’re pulling for our partner Charley Hoffman to come up huge! Charley and playing partners Brooks Koepka and William McGirt tee off from Hole No. 1 at 11:33 a.m. EDT. Follow the action on NBC (Noon-3:30 p.m.) and Golf Channel (3:30-6 p.m.).